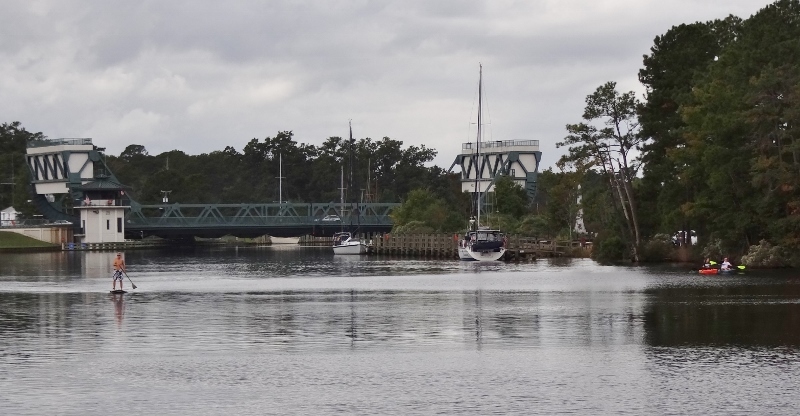 Observant readers may recognize the area as we’ve stopped at the free docks before- one you can see below, south of the bridge and the one just north of the bridge that sits between the bridge and the Great Bridge Lock. The 20+ miles south of the lock is non-tidal, affected by wind direction and strength. Another plus is the stretch from the lock to AYB is a no-wake zone, making for comfy alongside docking and the opportunity for safe and calm rowing and paddling in your small water craft or board. See photo below. 🙂 Recognize anyone? 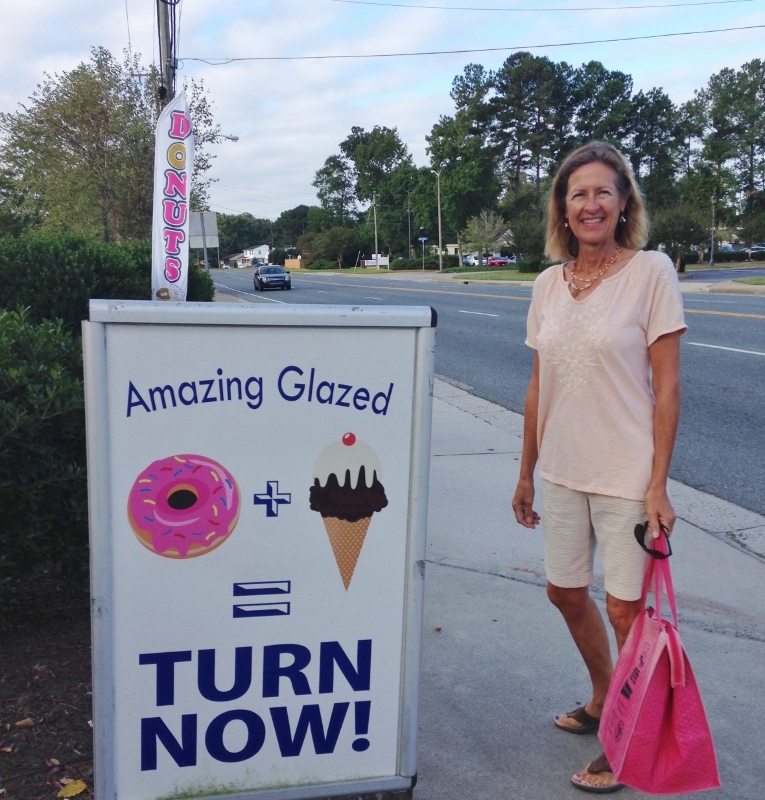 Are you surprised to read that we also found a new donut place that opened since we last walked “that far” five years ago? Didn’t think so. Maybe a 20 minute walk from boat to shop, on sidewalks mostly; easy Sunday stroll. 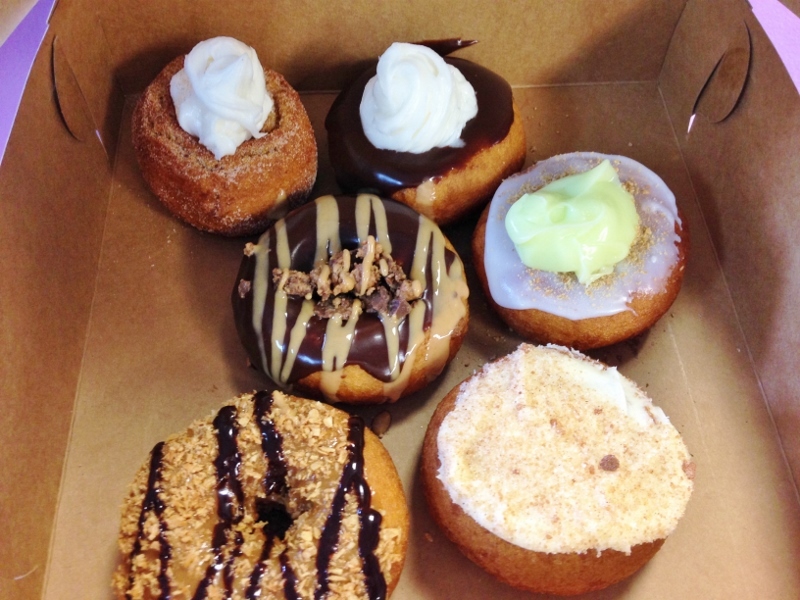 A new donut place for us, farther than we usually walk to Chili’s, or the Farm Fresh. 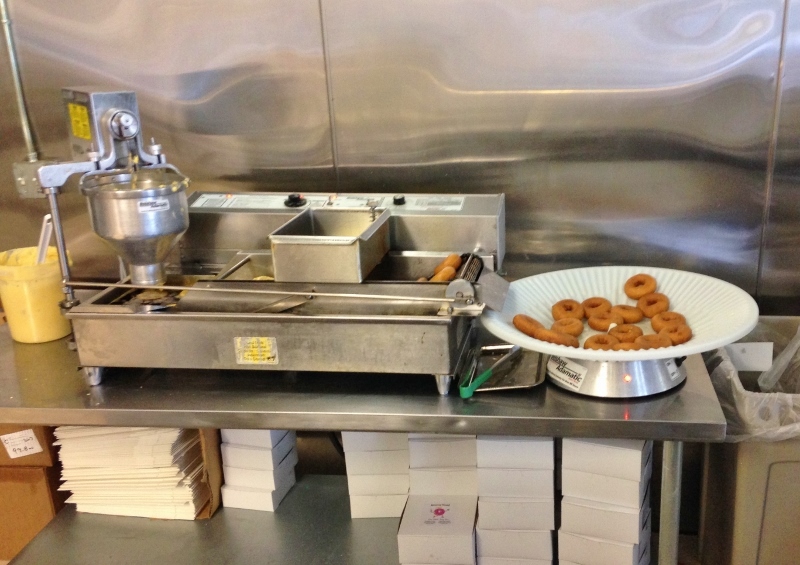 The place seems like a mini chain, everything just so and boy they can churn out plenty of custom topped doughnuts. I’d doubted that ability but when we saw the operation, it made sense. A printed menu is available; Chinese menu style. Pick a batter, this time pumpkin was the second choice in addition to regular. Select a frosting from a short list. Then select from a long list of toppings, and finally a drizzle of which there’s roughly six choices. There’s also a board with large photos and descriptions in case you need decision-making help. Yes please! Decorated while you wait, shown to you for your approval as you pay, and off you go! People and organizations call in large orders too. Have you seen this? (below) Not that I’m promoting wasteful extra plastic but the idea is clever and the wine was actually a better price than we typically pay for it. The bottom of the ice bucket is overlapped in an attempt to stop water leakage. 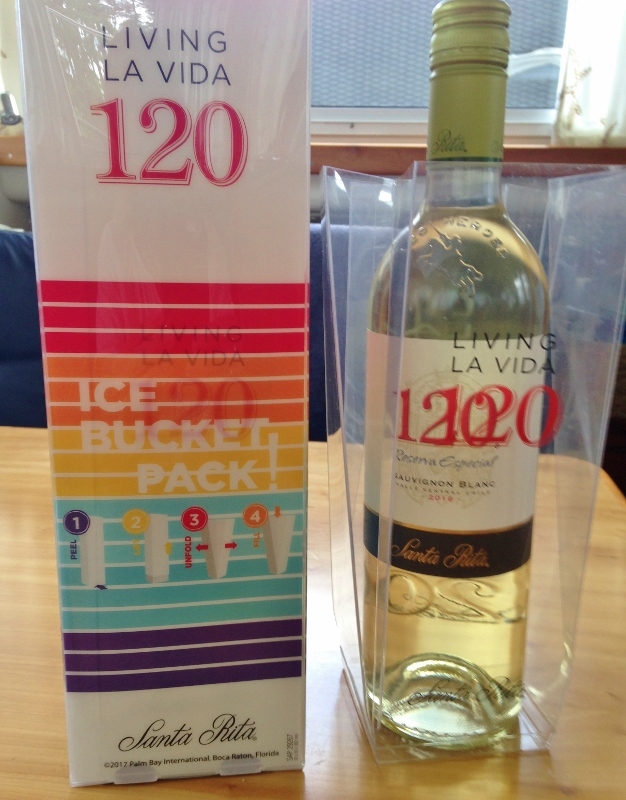 We bought three, kept one bucket- you know, just in case. The bascule bridge opens on the hour. 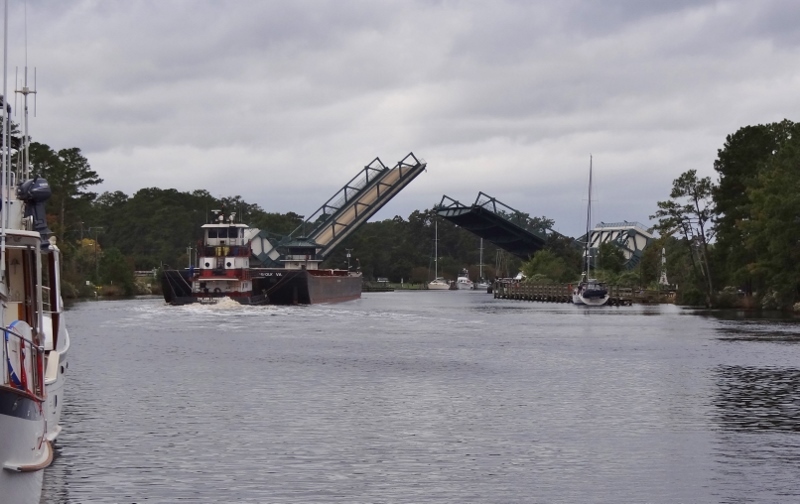 Northbound boats proceed under the bridge, then into the lock. 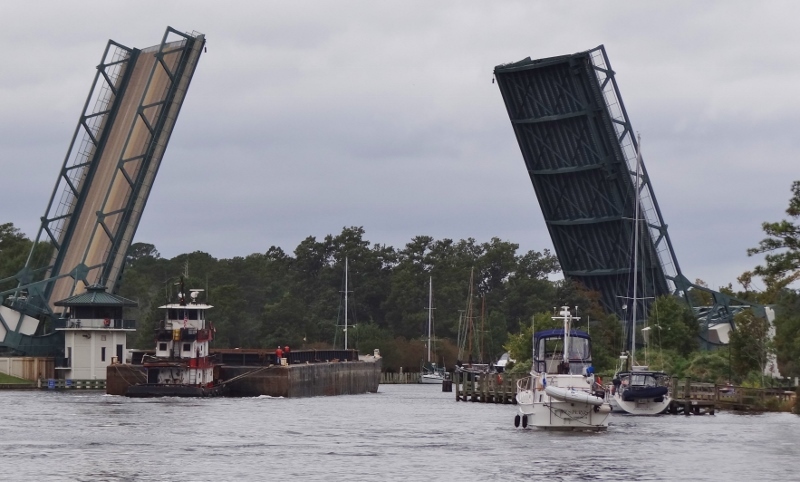 At the same time, southbound boats are exiting the lock and they proceed through the bridge on the hour too. At times the lock is full, but not usually. Sometimes things get interesting when a tug and barge commands an entire side of the lock, leaving just one side for the rest of us. 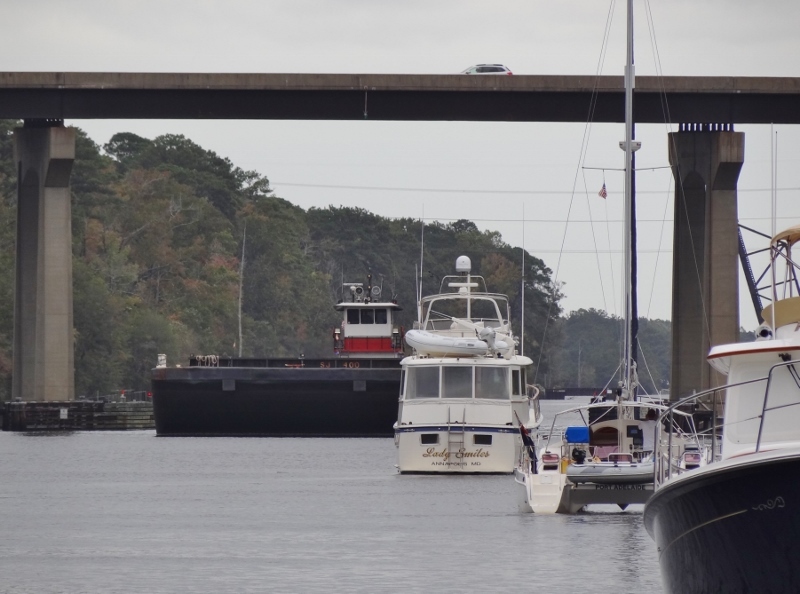 The noon bridge opening on Monday, Oct 9 was shaping up to be worth watching as two northbound tugs lay in wait. Tug & barge has to angle over to get enough room to maneuver straight through the bridge. It’s few minutes before noon so the bridge is preparing to open- timing is key. The boats you see on the left edge of the above and below photos are those docked at AYB along with Twins and many others. In the above photo the tug & barge looks huge doesn’t it? 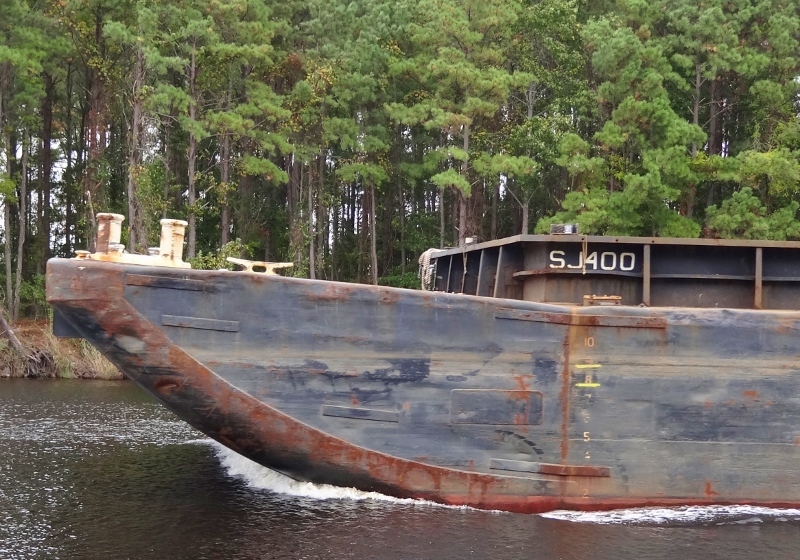 I think the barge is 50+ feet wide. But below, not so intimidating from that angle. The second tug had been waiting further south, just past where the Yacht Basin ended. 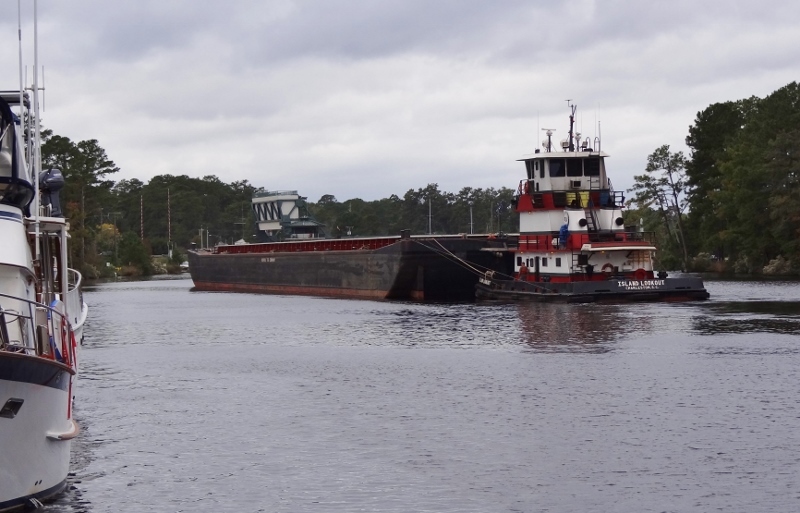 Had to wonder what the two southbound boats were thinking, but the tug operator never yelled at them. But wait, there’s more. Even to us, those two boats looked to be in the way. As the dynamic duo passed by us we got a good look at the barge. Yep, easily amused today. You realize don’t you that every time the bridge opens, traffic stops. Battlefield Blvd is a busy road and traffic gets majorly backed up when the wait is this long. The trawler had hailed the bridge wondering if he had time to get through, but the bridge tender isn’t going to be responsible for that call. Any southbound boats are still waiting their turn to pass under the bridge after the barge gets through. Oh the traffic backup. Times like these make us glad we travel the waterways.